In the nineteen-seventies a feral flock of several thousand sheep could be found on Pitt Island in the Chatham group, New Zealand. These possibly derived from Saxony Merinos first taken to South-East Island - another island in the Chatham group - in 1841 and later transferred to Pitt Island. In any case, the flock is known with certainty to have been in existence for almost a century. A Reserve for 300 of these animals was created on Pitt Island in 1981. A number have also been taken to mainland New Zealand. 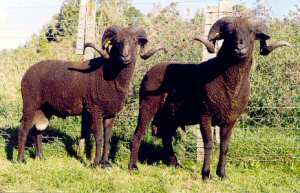 Pitt Island sheep are almost all colored and have the self-shedding fleeces characteristic of feral breeds. The rams are impressively horned - up to a meter long measured around the curve. In a study made of the sheep on the Reserve in 1981, Dr M. R. Rudge found that only 11.1% of rams and 8.8% of ewes were white; 97% of rams were horned but only 13% of the ewes had true horns, though 54% of the ewes had scurs.